Brick Town Talk: Under Construction - LEGO Town, Architecture, Building Tips, Inspiration Ideas, and more! Men at Work- (BTT) You know you hate the dust and reduced speed limits, but construction is a necessary evil. You wouldn't want the building that you're reading this in to fall down around you, would you? No. But, construction doesn't always have to be ugly. Just one look at these modified modular buildings shows how good it can look. 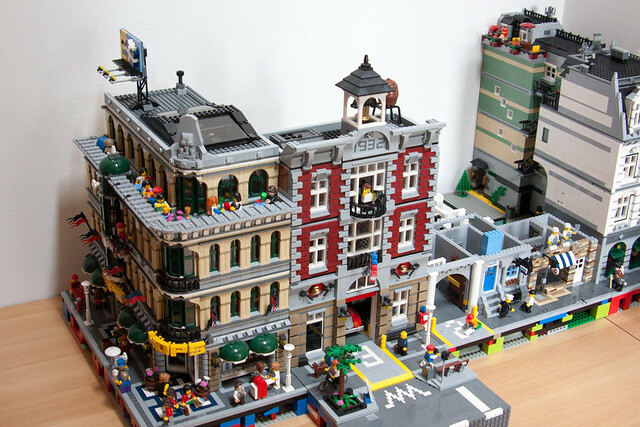 The modified Grand Emporium, with bar, rooftop gallery, expanded toy store (Now stocking Lego! ), and cafe doesn't missuse the larger floor plan. The growing Fire Brigade, meanwhile, has incorporated another floor, complete with balcony, and what looks like a new garage, under construction. We'll keep you posted on the progress of this project! Looks like a cool project, I look forwards to the updates.